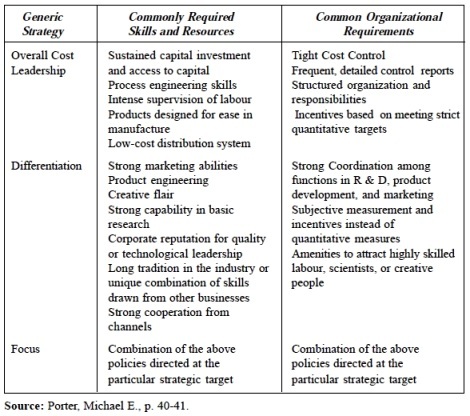 Two perspectives on strategy and structure are described here: One by Michael E. Porter (Competitive Strategy, The Free Press, New York, 1980) and the other by Thomas J. Peters and Robert H. Waterman Jr. (In Search of Excellence, Warner Books, 1982). Porter has enunciated three generic strategies: Overall Cost Leadership, Differentiation and Focus. According to him the successful implementation of the three generic strategies requires not only different resources and skills but also imply different organizational arrangements, control procedures and inventive systems. Overall cost leadership (common in 1970s in the USA) is achieved through a set of functional policies culminating into what is popularly known as the Experience Curve Effect. This strategy requires construction of efficient scale facilities, vigorous pursuits of cost reduction from experience, tight cost and overhead control and cost minimisation in areas like R&D, sales force, advertising and so on. A great deal of managerial attention to cost control is necessary to achieve the aims. The differentiation strategy implies offering a product or service by the firm which is perceived in the industry as being unique. Differentiation can be approached in many ways (one or more at the same time); product design features, brand image, technology, customer services, dealer network and other dimensions. The focus strategy means concentrating on a particular buyer group, segment of product lines, or geographic market. As with differentiation, focus may take many forms. Whereas the ‘low cost’ and ‘differentiation’ strategies aim at achieving their objectives industry-wise, the focus strategy is built around serving a particular target very well. All functional policies are geared in that direction. This strategy rests on the premise that the firm is able to serve its narrow strategic target more effectively and efficiently than those competitors who are engaged in broader activities. Industry Maturity and Organizational Arrangements: According to Porter, not only different organizational arrangements, leadership and motivation systems are needed for different generic strategies, different organizational structures and systems are also needed as the industry transitions to maturity. Some suitable adjustments must take place in the area of control and motivation system as well. As the industry matures, more attention to costs, customer service and true marketing (as opposed to selling) may be required. More attention to refining old products rather than introducing new ones may be necessary. The less “creativity” and more attention to detail and pragmatism is often what is needed in the mature business. These shifts in competitive focus obviously require changes in the organizational structures and systems to support them. Systems designed to highlight and control different areas of business are necessary. The various elements of the structural and system requirements of mature business are tabulated in Exhibit -1. Major changes in plant manager’s job. In short, it may be stated that there has to be more emphasis on formal arrangement than on the informal ones as hitherto. The competitive shifts (e.g., aggressive marketing, price competition) and new organizational requirements may be presented to by people within the organization who till the other day found pride in pioneering high quality products. Sacrificing quality for costs and close monitoring of costs may be resisted. Furthermore, new reporting requirements, new controls, new organizational relationships and other changes may sometimes be seen as a loss in personal autonomy and as a threat. A company therefore must be prepared to re-educate and remotivate personnel at all levels as it enters the maturity stage. Large companies tend to be complex. Unfortunately, many of such companies, according to Peters and Waterman, respond to complexity by designing complex systems and structures rather than simple ones. A favourite candidate for the wrong kind of complex response is the matrix organization structure. For a multiproduct, multi-location and multi-market company, with several functional departments, a four dimensional matrix may be a normal choice. However, such a matrix is a “logical mess”. The matrix is quite confusing: “people aren’t sure to whom they should report for what. The most critical problem, it seems, is that in the name of “balance”, everything is somehow hooked to everything else. The organization gets paralysed because the structure not only does not make priorities clear, it automatically dilutes priorities. In fact, it says to people down the line: “everything is important; pay equal attention to everything”. Excellent companies are quite flexible in responding to fast changing conditions in the environment. They make better use of small divisions or other small units. “They can reorganise more flexibly, frequently, and fluidly. And they can make better use of temporary forms such as task forces and product centres” and other ad hoc devices. Most of the reorganization takes place around the edges. The fundamental form rarely changes that much. Product divisions are the building blocks in the structure of the excellent companies. A characteristic of structures in such companies is the shifting of people and even products or product lines among divisions on a regular basis and without acrimony. The simple form is not limited to companies—specialized in creating niches for themselves. Other companies such as HP, Emerson, Digital, Dana and 3M have also simple structures. Regardless of industry or apparent scale needs, virtually all the companies pushed authority far down the line and tried to preserve or maximise practical autonomy for a large number of people. Simplicity in basic structural arrangement actually facilitated organizational flexibility. Emerson Electric has 54,000 employees, with fewer than 100 in the corporate headquarters. Dana employs 35,000 employees and has cut its corporate staff from about 500 in 1970 to around 100 by 1982. Schlimberger, a $ 6 million diversified oil service company, runs its worldwide empire wth a corporate staff of 90. That “less is more” also holds true for some of the top performing smaller companies. “ROLM, for instance, manages a $ 200 million business with about 15 people in corporate headquarters. “Virtually every function in the excellent companies is radically decentralized down to the divisional level at least.” Though strategic planning is regarded as a corporate function, yet, some companies such as 3-M, HP, J & J have no planners at the corporate level. Fluor runs its $ 6 million operations with three corporate planners. 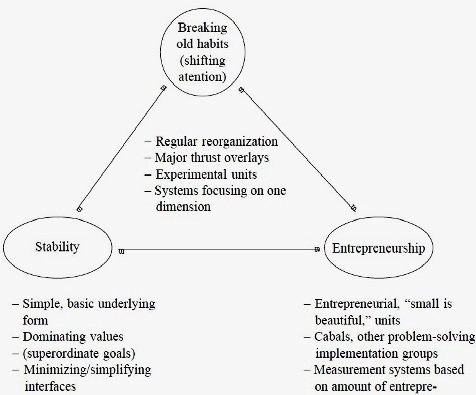 A structural form for the future should respond to three prime needs or properties: a need for efficiency around the basics (stability pillar); need for regular innovation (entrepreneurial pillar), and a need to avoid calcification by ensuring at least modest responsiveness to major threates (habit breaking pillar). The structural form should be based on these three pillars, each one of which responds to one of the three basic needs. The idea about the structural form for the future is depicted in Figure-1. The authors further say that an effective structure should have loose-tight property simultaneously. It is in essence the co-existence of firm’s central direction and maximum individual autonomy which the author calls “having one’s cake and eating it too.” Organizations that live by the loose-tight principle do so through “Faith”, through value systems. Beleif in customer, belief in granting autonomy, belief in quality are some of the values which great managers have demonstrated in their lives. What's up to every one, the contents existing at this site are genuinely awesome for people experience, well, keep up the good work fellows.